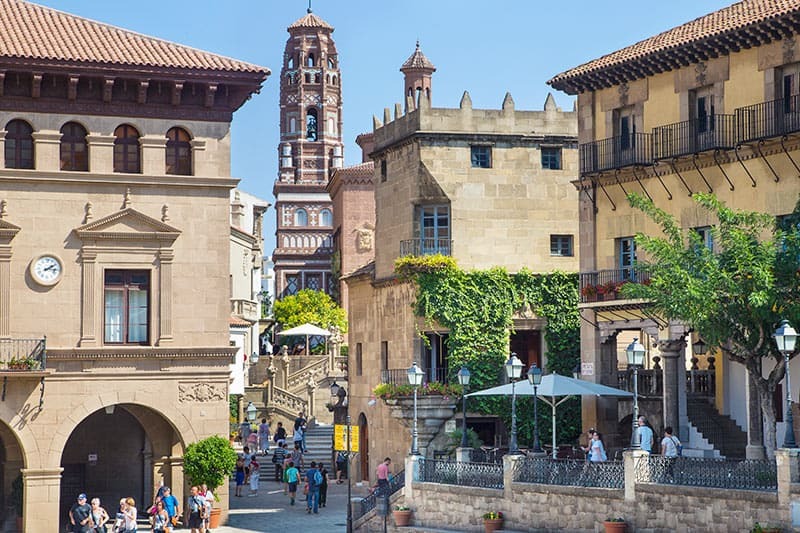 The brainchild of Josep Puig i Cadafalch, another of Barcelona’s talented Modernist men, Poble Espanyol was conceived as an open-air architectural museum and the pavilion dedicated to art for the 1929 Barcelona International Exhibition. 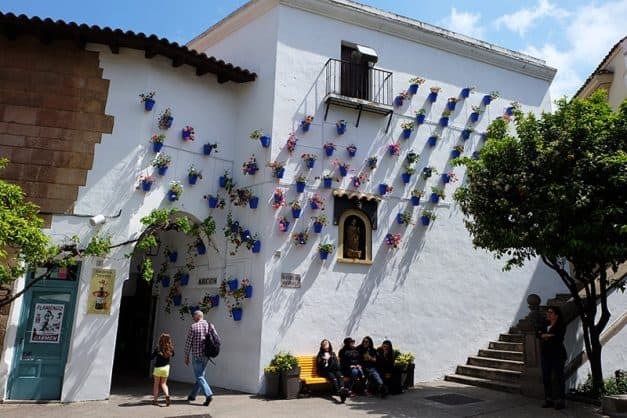 The name ‘Poble Espanyol’ is Catalan for ‘Spanish village’ and the idea of the museum was to recreate the atmosphere of Iberian village life using the traditional architecture of all the different regions of Spain, from Galicia to the Balearic Islands. 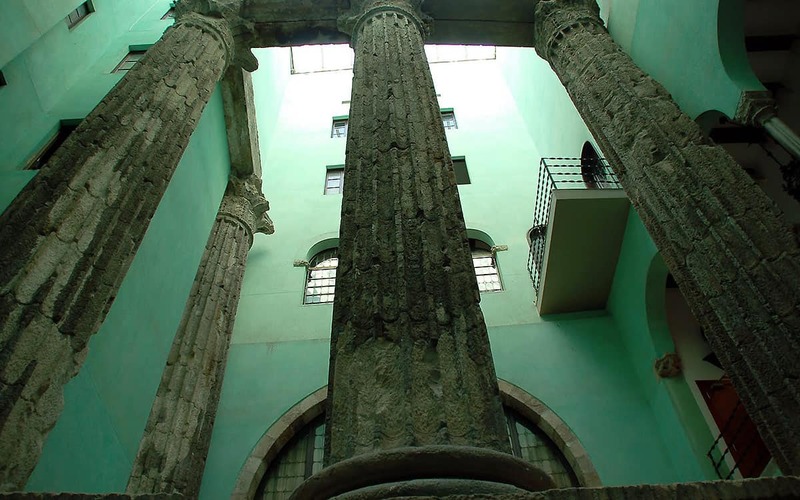 The exhibition was so popular that it has remained functioning ever since, and today tourists continue to enjoy a stroll around its cobbled streets, scenic squares and characteristic colonnades. 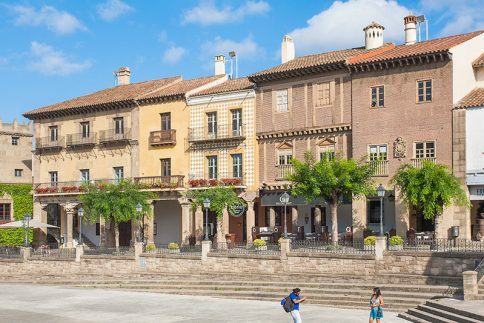 As well as showcasing Spanish architecture, many buildings reveal the country’s traditional artisanship and crafts, meaning that you can shop for handmade jewellery, glassware and leatherwork, amongst other souvenirs, here in Poble Espanyol. 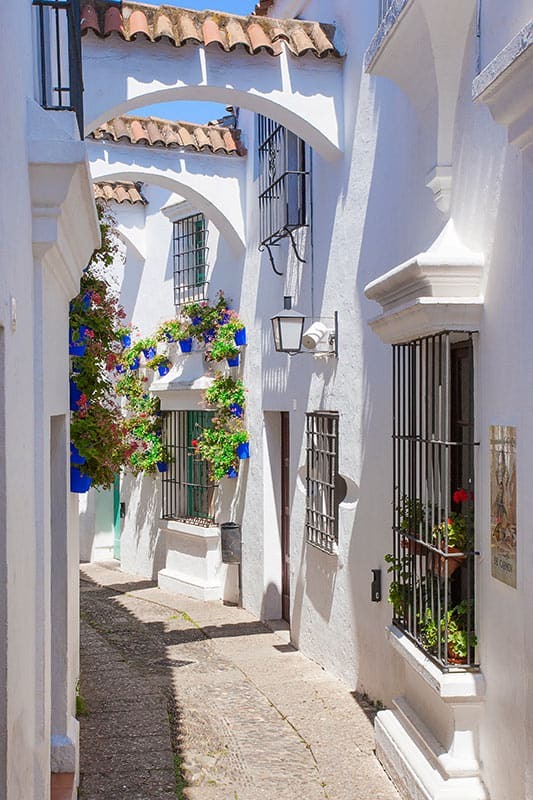 Several of the villas and houses function as charming cafes, restaurants, flamenco clubs and even discotheques (check out La Terrrazza in summer! 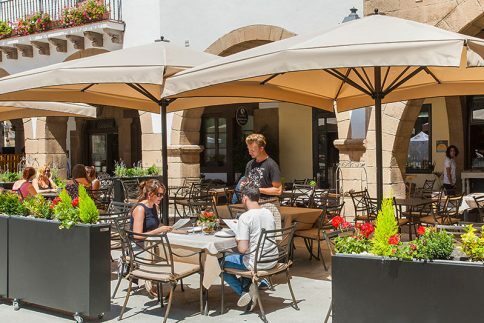 ), meaning the village is just a cool place to hang out away from the madness of central Barcelona. 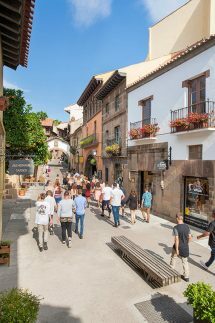 Poble Espanyol: What is there to see and do? You’ll find several great attractions within the village. Here are some of the best things to do in our opinion. Unless stated, all are free as part of your admission ticket. Barely mentioned in any guidebook, if this was anywhere else in Barcelona it would probably be considered the city’s greatest modern art museum. 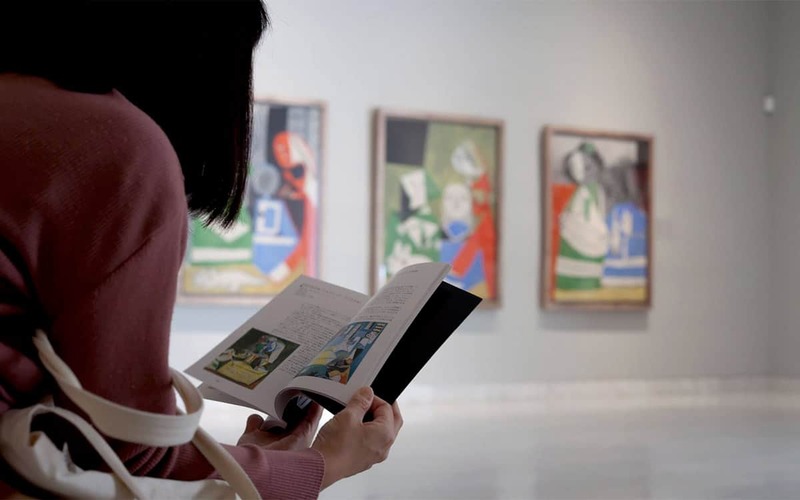 Works by Pablo Picasso, Joan Miro and Salvador Dali are amongst the 300 pieces on display, in what is a full scale riot of colour, creativity and daring forms. 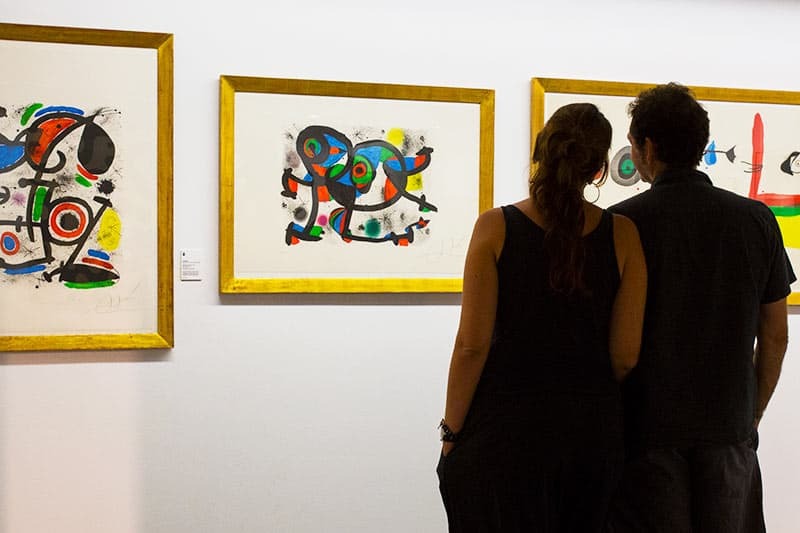 Overall a fantastic showcase of the rich world of 20th century Spanish art, and well worth the Poble Espanyol admission price alone. Note the museum has shorter opening times than the rest of the village, and is closed on December 25, 26 and January 1 closed. 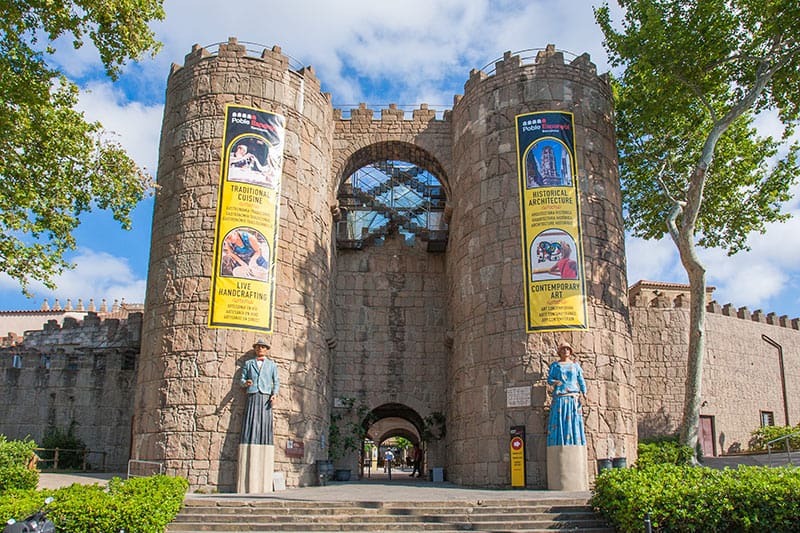 A new audiovisual display, launched in 2018, FIESTA: The Soul of Spain, is a rollercoaster introduction to some of the country’s most spectacular festivals and traditions. 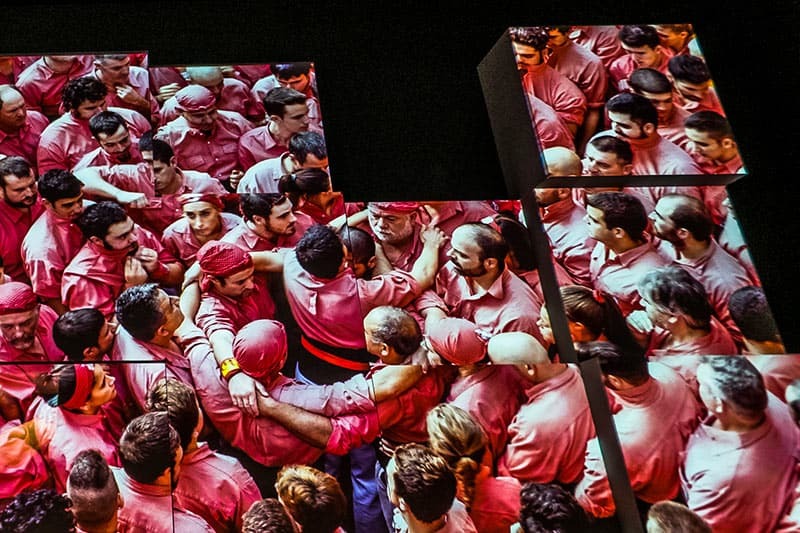 Projected on two 7-metre-high screens, formed out of stacked cubes, this 8 minute show introduces the viewers to legendary parties like La Tomatina, Los Fermines, Semana Santa and Jaleo, as well as the Catalan tradition of Castellers (human castles). The images are absolutely breathtaking (selected from 180 hours of footage, shot in 4k), and the sound shakes the ground and reverberates around the room. You can really feel the terror of bulls charging at you, the excitement of the magnificent Menorquin horses rearing and the tension of the crowd as the human towers grow dangerously higher and higher… this is definitely a show that gets the pulse racing! 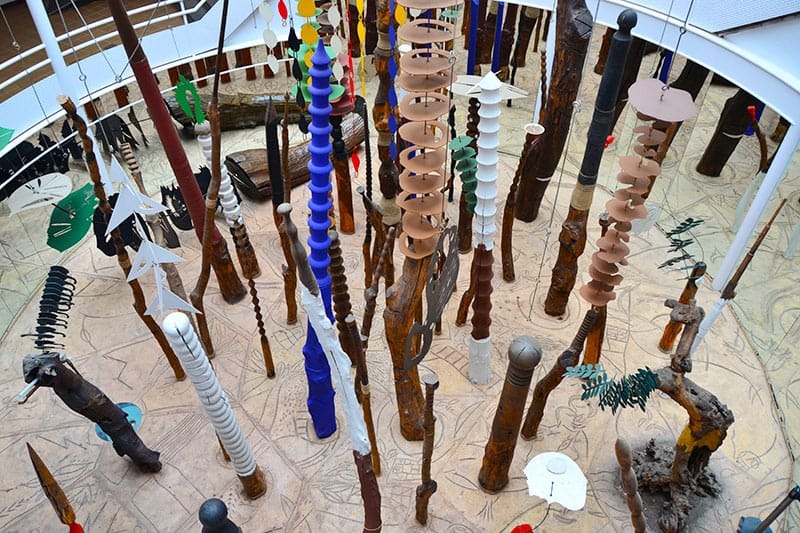 Occupying 3,000 square metres of natural surroundings, just outside the village’s architectural zone, is this ‘Sculpture Garden’, an open air museum displaying 36 sculptures of diverse styles and materials, created by 27 different contemporary artists. 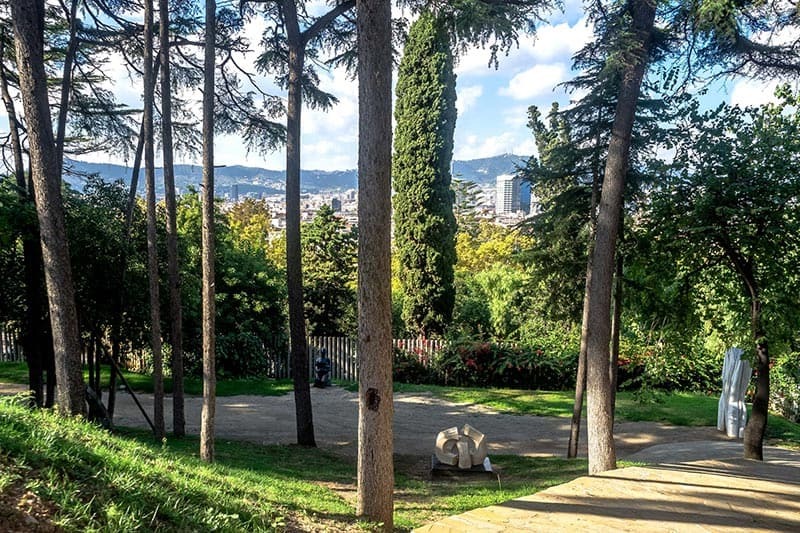 The green lungs of the village, there’s also a vantage point where you can get a unique view over Barcelona. Another new audiovisual installation, in fact Feeling Spain is five installations dotted across the village. Each one is a showcase of one of the country’s four regions highlights, from medieval towns to stunning countryside and wildlife, and almost bound to inspire some further travels in this magnificent country. A fifth installation focuses on The Way of Saint James, the epic pilgrimage that ends in Santiago de Compostela. 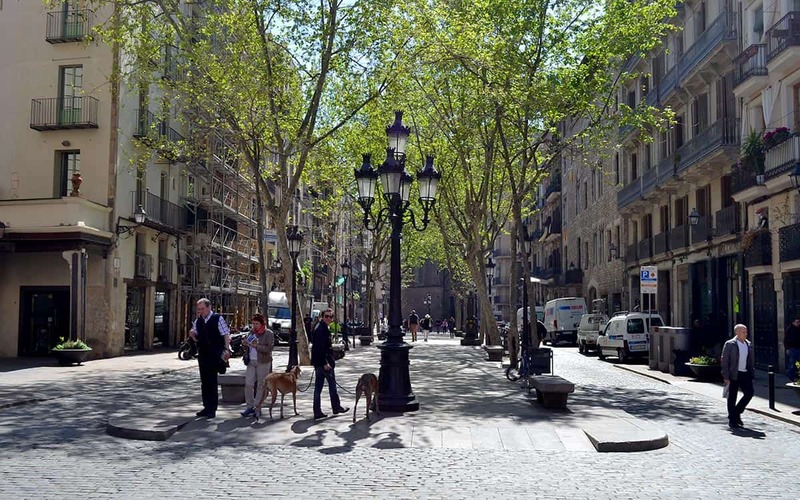 This large open space is occupied by the art installation Contorn-Entorn (“Contour-Environment”), by Josep Guinovart, an avart-garde Informalist who was active in Barcelona from the 1950s to the 1990s. It’s an intriguing combination of tree trunks and manmade sculpture. 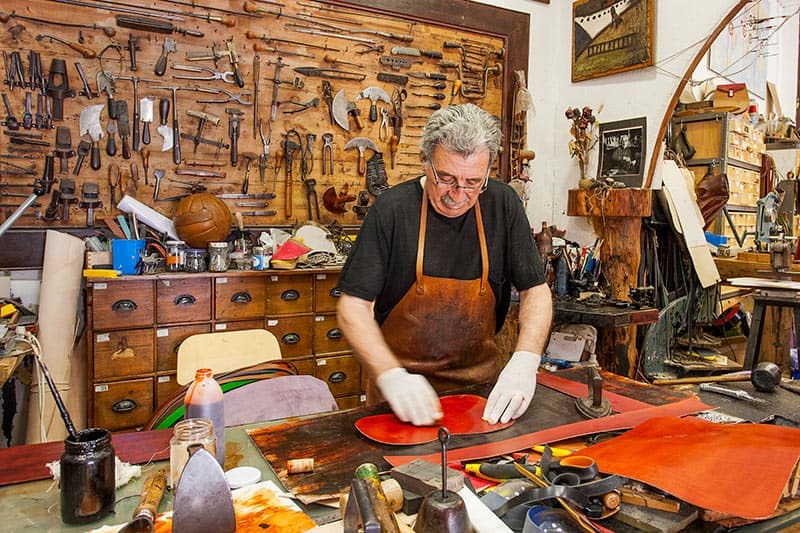 There are many traditional Spanish artisans based in Poble Espanyol, working with leather, textiles, ceramics and jewellery. With a bit of luck you should be able to see them at work, although they are not permanently active in our experience. The glassblowers in the South zone are usually a safe bet, and it’s fun to watch them tease an intricate trinket from a bauble of red hot glass. Their workshop could do with a tidy though, to say the least. 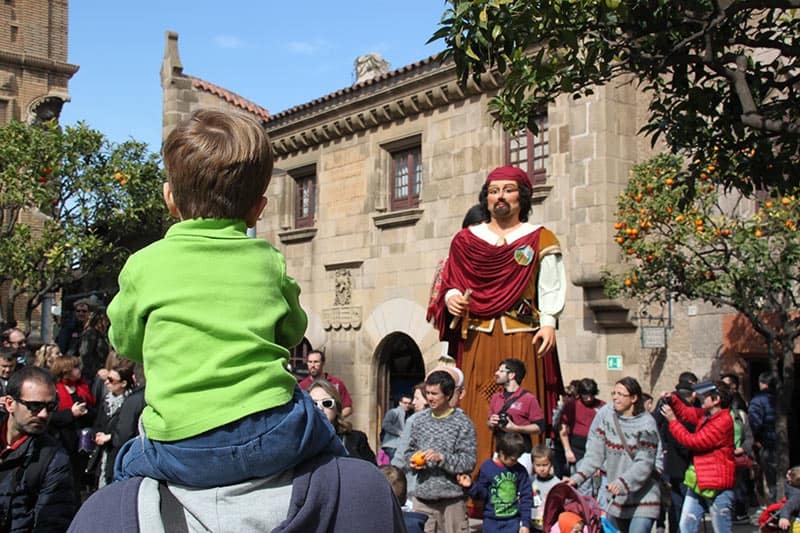 Those living in Barcelona will already be familiar with gigantes, the colourful giants that are invariably wheeled out during any Catalan festive occasion, and paraded around town. 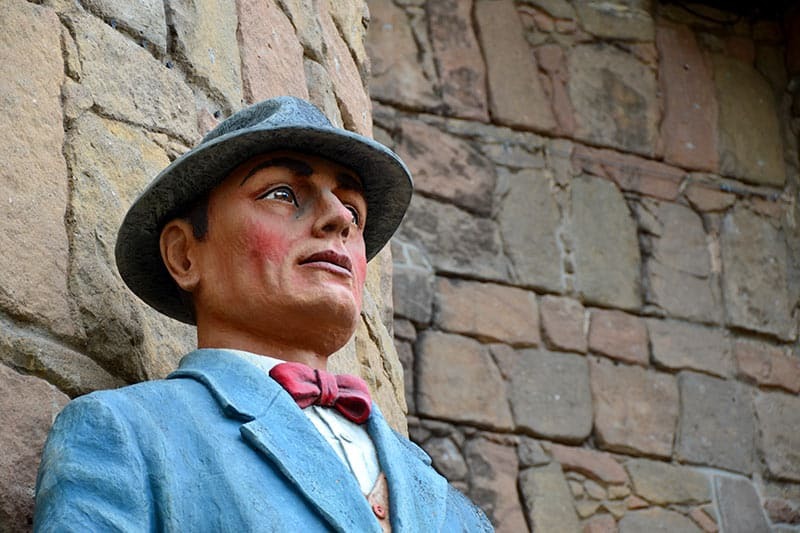 At Poble Espanyol two of these figures greet you at the gates… remarkably they are modelled on the very first two guests to pass through the village’s doors back in 1929. The whole of the village is effectively an open air architecture museum, but amongst the many beautiful buildings the monastery, which is removed from the main pueblo, is a highlight. 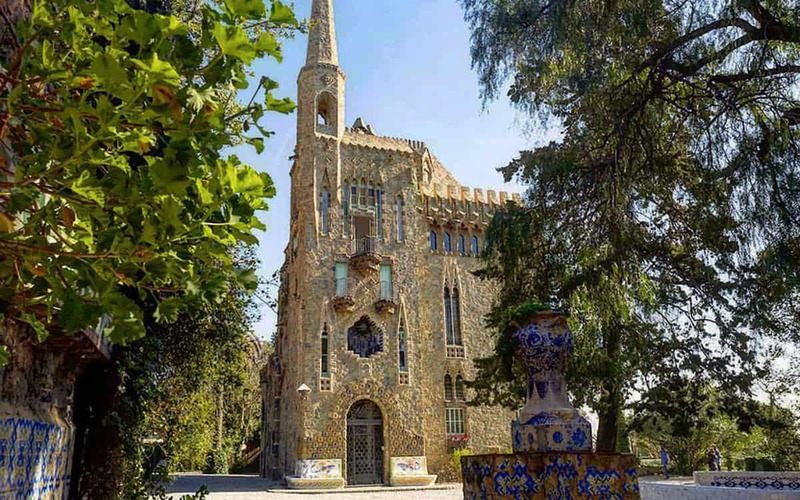 It was inspired by several Romanesque Catalan monasteries in the area, and the walls frescoes are decorated with frescoes by the Malaga-born painter Rafael Padilla (1878-1961). 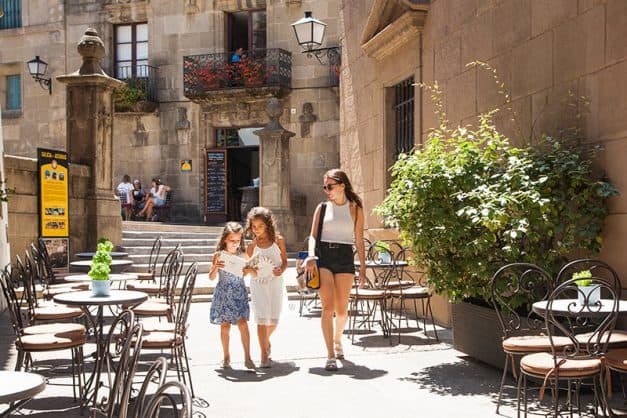 Those travelling to Barcelona with children, will find it easy to keep kids occupied in the village. Aside from the fact they will most likely enjoy many of the ‘grown up’ attractions above, and running around in this car free zone in general, the village recently received a new Children’s Area, which encompasses a number of slides within the Sculpture Garden. There’s also an active programme of events and workshops for kids, especially on Sundays, and during festivals like Halloween and Christmas. You can check what’s going on, on the official website. Finally, one fun option, is the ‘Gymkhana’ or treasure hunt. Armed with a backpack full of clues you have to explore the village and solve the puzzles to complete your quest. It takes about 60 minutes, and you can purchase the Gymkhana as an add on during the online ticket booking process (see more info below). The pueblo is open 365 days a year, so you’ll never be turned away. The hours depend on the day of the week and are as follows. 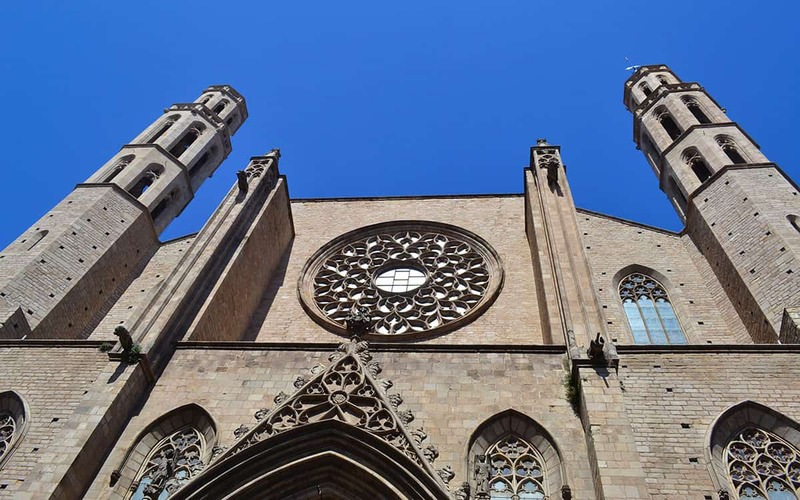 What’s the best way of getting to Poble Espanyol? 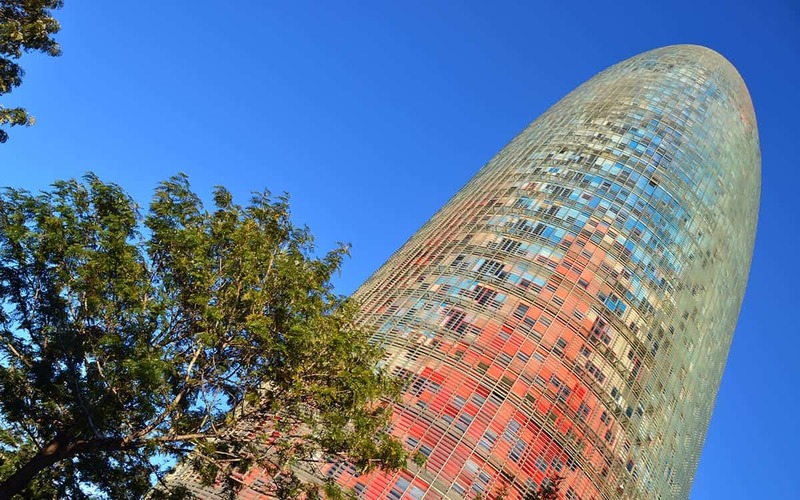 You can take the metro to Plaça Espanya (green or red line) and from there it’s a pleasant 15 minutes walk, through the Venetian towers, past the Magic Fountain and up through the wooded hill. Easy! The tourist bus also goes there, and you can buy tickets safely and securely via Get Your Guide. You can buy advance tickets to the village directly on the official website. Simply select your date, the number of people (discounts for students, children and seniors), and you’re good to go. In fact, whilst you are asked to specify a date, the ticket is valid for 14 days after the date you choose, so there’s some flexibility there. Advance tickets cost only €12.60 via their website, whilst they are €14 at the ticket office. Audioguide add on. While buying tickets, you can also elect to spend €3 more on an audioguide, which I’d recommend as there’s a lot to take in, and the guide helps clarify the regional origins of each section of the village. If you want to save money you could easily share one between two people. Gymkhana add on. If you want to do the village’s treasure hunt (great for kids! ), you can select the option during the booking process. 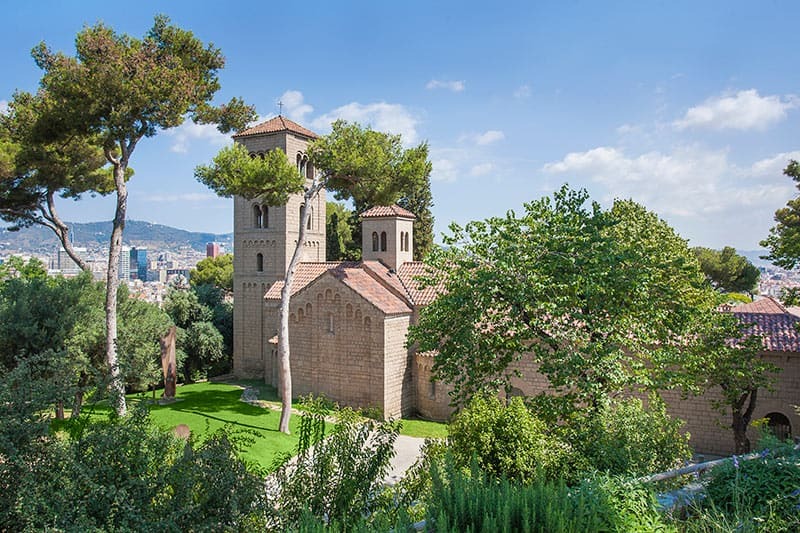 On the foothills of Montjuic, just ten minutes walk from Plaza España metro station, you can combine your visit to the Spanish Village with all manner of other great attractions, such as the Caixa Forum, Mies van der Rohe Pavilion, MNAC Museum and not forgetting the popular Magic Fountain shows that take place at night.